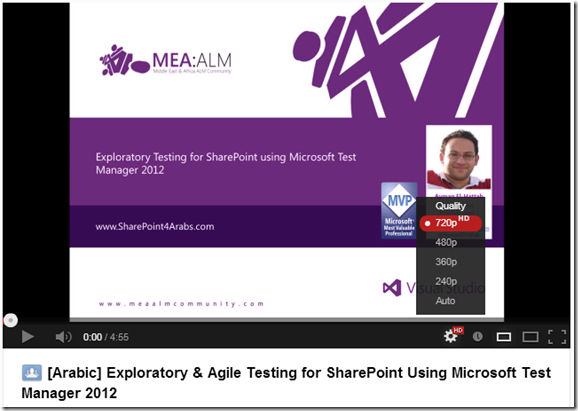 This video is part of the SharePoint Testing & Troubleshooting Arabic Video Series. In today’s video, you will learn how to do Exploratory Testing for your SharePoint solutions using Microsoft Test Manager 2012. You will learn about how exploratory testing (also called XT, or agile testing) has become a first-class experience in the toolset. 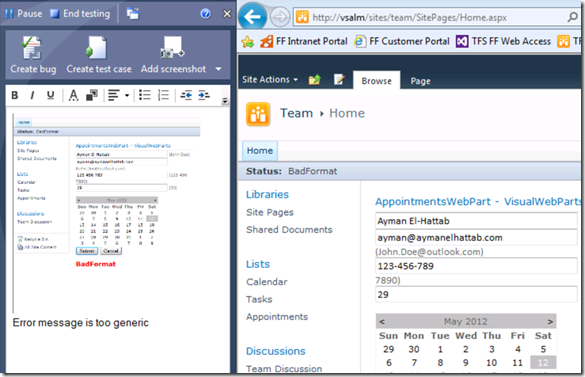 This allows a tester to more flexibly test the underlying SharePoint Application without relying solely on formal test cases. Meanwhile, Microsoft Test Manager will continue to capture rich diagnostics about the application being tested which can be delivered to the development team if a bug is discovered. You can watch the video from here. Note: You might need to change the quality to 720 p (HD) as shown above for the best viewing experience.